Doctor Who: The Sands Of Time | Warped Factor - Words in the Key of Geek. 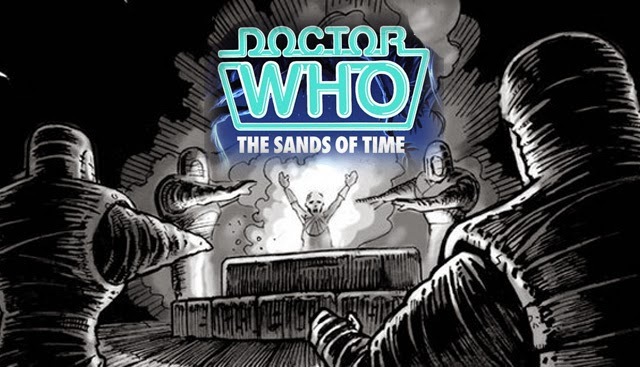 Christopher Morley journeys deep into the land of the Pharaohs, crossing the Sands Of Time with the Fifth Doctor, Tegan and Nyssa. 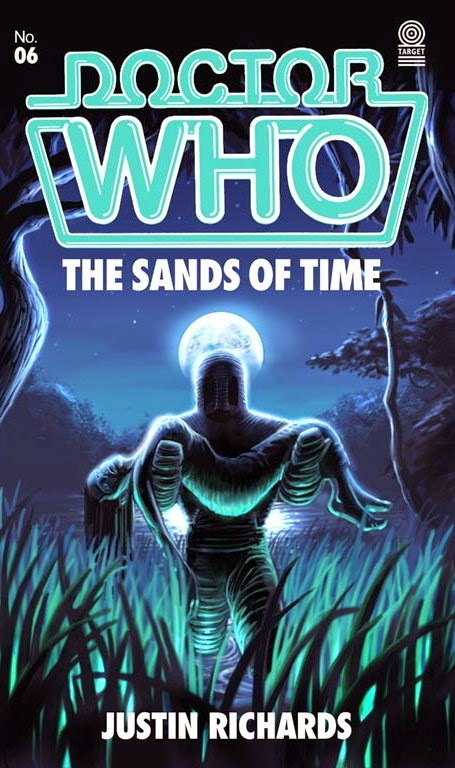 If you raved over Pyramids Of Mars, chances are you'll find plenty to like in the pages of The Sands of Time - the novel functioning as both prequel and sequel to the earlier clash between the Time Lord and the last of the Osirians. Indeed you'll recognise the archaeologist who comes to dinner at Kenilworth House at the very end- here he's a younger man yet to battle a certain chap in a scarf with a fondness for jelly babies having been possessed by Sutekh. Speaking of the god-like being also known as ''the Typhonian Beast'' among other names, it's his sister/wife Nephthys who takes on his mantle in a sense here. Here's where it gets a bit complicated, but brilliant. Remember a very special cricket match at Cranleigh Hall in which the well-versed wicket fan helps the Lord of the manor out of a bit of a sticky wicket on the field of play? Now the Doctor has one of his own, and he's going to ask a hell of a favour of his newly- wed cricketing chum based on the close resemblance of his new Lady to the Trakenite he's been travelling with since the latter days of his past incarnation. Since falling off the radio telescope he's had quite a change of personality, going from decidedly alien to almost human and terribly vulnerable. No wonder he'll need a cup of tea after finding some Victorian hotel accommodation for himself and the Aussie ''mouth on legs'' before he can even bring himself to deal with the business of getting Nyssa back. But of course he will, and how. We return once more to Black Orchid territory for a second. You'll recall how Nyssa and the then Ann Talbot play a prank on their fellow guests at a ball? ANN: My dears, I've had an absolutely ripping idea. NYSSA: Oh, how lovely. That's lovely. ANN: My dear, I'm so glad you think so. Look. There. With the headdress nobody, but nobody, will be able to tell us apart. Isn't that topping? Now imagine how similar trickery might be deployed in order to foil the plans of Sutekh's sister/spouse to regain physical form! And there's a good reason for it-though historical research suggests her bond with her brother never actually went as far as marriage, even if such unions were commonplace in the royal dynasties of Ancient Egypt in a bid to keep bloodlines pure. The American Research Centre In Egypt (ARCE) devoted time to discussion of the subject at its 58th Annual Meeting. "In many Egyptological works, it is taken for granted that the deities Seth ( yet another name of Sutekh's) and Nephthys were married. Their relationship has been interpreted as a parallel, and sometimes a dark mirror, of that between their sister and brother, Isis and Osiris. This conclusion is largely drawn from Plutarch's De Iside et Osiride, which spells out these relationships. Some have projected Plutarch's story backwards, seeing evidence for the marriage as early as the Pyramid Texts. However, there is very little in original Egyptian sources which specifically links Seth and Nephthys. This evidence is limited geographically and chronologically, much of it from the New Kingdom in Thebes, and the Roman period in the western oases. The later evidence especially suggests that while Nephthys's marriage to Seth was a part of Egyptian mythology, it was not a part of the myth of the murder and resurrection of Osiris. She was not paired with Seth the villain, but with Seth's other aspect, the benevolent figure who was the killer of Apophis. This was the aspect of Seth worshiped in the western oases during the Roman period, where he is depicted with Nephthys as co-ruler. It is likely that this was the inspiration for the paintings of Nephthys and Antaios, found in Qaw el-Kebir. This later mythology was probably conflated with the Osiris myth by Plutarch's time." Next we might look into just what these Pyramid Texts were? And we have Samuel Mercer's 1952 translation to aid us in our search. Sacred Texts provides a handy introduction to Mercer's handiwork! "The Pyramid Texts were funerary inscriptions that were written on the walls of the early Ancient Egyptian pyramids at Sakkara. These date back to the fifth and sixth dynasties, approximately the years 2350-2175 B.C.E. However, because of extensive internal evidence, it is believed that they were composed much earlier, circa 3000 B.C.E. The Pyramid Texts are, therefore, essentially the oldest sacred texts known." "According to a very ancient Egyptian tradition, the god Osiris, who was originally the god of the principle of the fertility of the Nile, became incarnate on earth as the son of Geb, the Earth-god, and Nut, the Sky-goddess. He had two sisters, Isis and Nephthys, and one brother, Set; he married Isis and Set married Nephthys. Geb set Osiris on the throne of Egypt, and his rule was beneficent and the nation was happy and prosperous. Set marked this and became very jealous of his brother,and wished to slay him so that he might seize his throne and take possession of Isis, whose reputation as a devoted and loving wife and able manager filled the country. By some means or other Set did contrive to kill Osiris: according to one story he killed him by the side of a canal at Netat,, near Abydos, and according to another he caused him to be drowned. Isis, accompanied by her sister Nephthys, went to Netat and rescued the body of her lord, and the two sisters, with the help of Anpu, a son of Rā the Sun-god, embalmed it. They then laid the body in a tomb, and a sycamore tree grew round it and flourished over the grave. A tradition which is found in the Pyramid Texts states that before Osiris was laid in his tomb, his wife Isis, by means of her magical powers, succeeded in restoring him to life temporarily, and made him beget of her an heir, who was called Horus. After the burial of Osiris, Isis retreated to the marshes in the Delta, and there she brought forth Horus. In order to avoid the persecution of Set, who on one occasion succeeded in killing Horus by the sting of a scorpion, she fled from place to place in the Delta, and lived a very unhappy life for some years." And so to Mars.......for the Doctor, anyway- later, or should that be earlier?